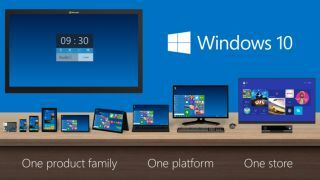 Microsoft's decision to name its new operating system Windows 10 (rather than Windows 9) certainly came as a surprise, with many people suggesting that it was done to place more distance between itself and the not-so-well received Windows 8. Now, one Reddit user has claimed to know the actual reason behind the curveball. Posting in the /r/technology subreddit, a self-proclaimed Microsoft developer going by the name of Cranbourne wrote that it was done to avoid conflict with third-party code that searches for "Windows 9*". Cranbourne reckons that such code isn't referring to Windows 9, but rather Windows 95 and Windows 98, with the asterisk acting as a wildcard. Early testing by Microsoft developers apparently revealed it would cause enough of an issue due to the oodles of programs that would search for code related to those two platforms, causing the company to take the "pragmatic solution" by moving to Windows 10.
and that this was the pragmatic solution to avoid that." "Windows 10 carries Windows forward into a new way of doing things. It is not an incremental change, but a new Windows that will empower the next billion users." That totally clears that up, then.